Rendering in the Authorized Version of the Hebrew or , following the Septuagint and the Vulgate. Aquila and Saadia, on Job xxxix. 9, read "rhinoceros"; Bochart ("Hierozoicon") and others, "oryx," or "white antelope"; Revised Version, "wild ox" (margin, "ox-antelope"). The allusions to the "re'em" as a wild, untamable animal of great strength and agility, with mighty horns (Job xxxix. 9-12; Ps. xxii. 21, xxix. 6; Num. xxiii. 22, xxiv. 8; Deut. xxxiii. 17; comp. Ps. xcii. 11), best fit the aurochs (Bos primigenius). This view is supported by the Assyrian "rimu," which is often used as a metaphor of strength, and is depicted as a powerful, fierce, wild, or mountain bull with large horns. The term evidently denotes from its connection some animal of the bovine or antelope class, perhaps the oryx (so LXX.). The oryx, as well as the wild bull and ox, is common in Palestine and Syria; and aurochs' teeth were found by Tristram on the flooring of an ancient cave in the Lebanon. The Talmud has for "re'em" or , which etymologically recalls the Arabic "ghazal" (= "gazel"), but is said to be the name of an animal of such size that it could not enter the ark of Noah, but had to be fastened thereto by its horn (Zeb. 113b; comp. B. B. 74b; Shab. 107b; Yalḳuṭ Shim'oni, ii. 97d, where it is said that the re'em touches the clouds). If the Talmud intended the urzila for the unicorn, it can not be identical with the one-horned ox which Adam is said to have offered as sacrifice (Ḥul. 60a and parallels), because the urzila is classed among the animals of the field that may not be offered for that purpose. The Tosefta on the passage in Zebaḥim explains the urzila as the buffalo. Again, in Ḥul. 59b is mentioned an animal called (perhaps shortened from "monoceros" or "rhinoceros"), which, "though it has only one horn, is allowed as food," and is then explained as the "hart of the forest 'Ilai" ( ; comp. B. B. 16b). The Talmud apparently thinks here of the antelope oryx, the mode of depicting which on Persian monuments gave rise to the belief by the ancients (comp. Pliny, "Historia Naturalis," viii. 21, 30) in the existence of the unicorn (comp. "S. B. O. T.," Psalms [Eng. transl. ], p. 173). In Arabic likewise "re'em" is applied to the leucoryx. The aurochs is mentioned in the Talmud under the name (= "ox of the plain"), in explanation of , the rendering of (Deut. xiv. 5) by the Targum, which Rashi (Ḥul. 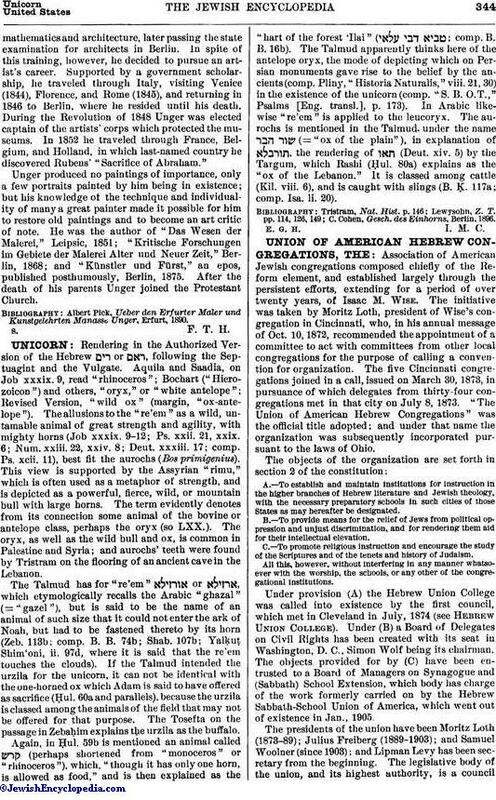 80a) explains as the "ox of the Lebanon." It is classed among cattle (Kil. viii. 6), and is caught with slings (B. Ḳ. 117a; comp. Isa. li. 20). C. Cohen, Gesch. des Einhorns, Berlin, 1896.